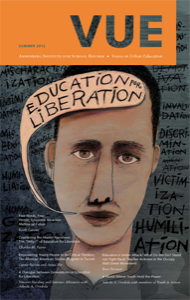 In the summer 2012 issue of VUE, developed in partnership with the Education for Liberation Network, participants from the 2011 Free Minds Free People Conference write about the liberatory potential of education. Through myriad lenses, these teachers, students, activists, and scholars focus on the crucial ways that education forms the most basic foundation of a democratic, equitable society and what it means to engage in education for liberation. This issue of Voices in Urban Education was developed in collaboration with the Education for Liberation Network (EdLib), a national coalition of teachers, community activists, youth, researchers, and parents who believe a good education should teach people – particularly low-income youth and youth of color – to understand and challenge the injustices their communities face. EdLib hosts Free Minds, Free People (FMFP), a national gathering that brings these groups together every two years to build a movement to develop and promote education as a tool for liberation. The network seeks to develop ways of teaching and learning both in and out of school that help us to build a more just society. The conference is a space in which these groups can learn from and teach each other, sharing knowledge, experience, and strategies. It takes place every other year. The last FMFP, of which the Annenberg Institute for School Reform was a co-sponsor, took place in Providence, Rhode Island, in 2011. The next conference will take place in Salt Lake City, June 27–30, 2013. Please visit www.fmfp.org for more information. EdLib also co-publishes, in partnership with the New York Collective of Radical Educators, a unique social justice lesson plan book for teachers called Planning to Change the World. Please visit www.justiceplanbook.com to learn more and order the 2012-2013 edition.